You can positively feel the impatience from some quarters of the Idaho Legislature itching to undercut and undermine the expansion of Medicaid that Idaho voters approved by a 61 percent majority. This expansion will provide health care coverage for some 60,000 Idahoans who have been trapped in limbo without health insurance. But it will only do so if political conservatives in the Idaho Statehouse, whose resistance to the Affordable Care Act has become a reflexive political religion, resist trying to sabotage the will of the people by capping benefits, reducing eligibility or otherwise undercutting the expansion as they figure out how to pay for the state’s 10 percent of expansion costs. Lawmakers would do well to heed the words of the state’s Chief Justice Roger Burdick: If you come to undo the people’s will, don’t bring a lousy argument. OK, Burdick didn’t put it that way. But in his dismissal this week of a lawsuit brought by Brent Regan and the Idaho Freedom Foundation – the secretly funded libertarian political action group that identifies as a nonprofit charity to avoid taxes – Burdick repeatedly clarified that weak, knee-jerk arguments about the unconstitutionality of the ACA and Medicaid expansion would not suffice, and that when citizens pass an initiative it is every bit the legal equal of legislative action. As per the, you know, state constitution. The desire of Idaho conservatives to resist Medicaid expansion at the expense of Idahoans has been a shoddy spectacle year after year. At the outset, the state refused to expand Medicaid, as did most conservative, Obama-hating states; that helped create a situation in which tens of thousands of Idahoans who made too little to qualify for Obamacare subsidies but too much to qualify for Medicaid were left in a coverage gap. Polling showed widespread support for expansion, but at every turn, Idaho conservatives ignored the wishes and the wisdom of this majority, of the state’s medical community, of patients themselves pleading for relief. The Legislature formed a task force to study the issue – and then ignored its clear recommendation in favor of Medicaid expansion. Repeatedly, Idaho’s politicians in Boise tied themselves into knots trying to solve the problem of the Medicaid gap, while avoiding the most obvious, cheapest solution because it carried for those lawmakers the ideological taint of the ACA. 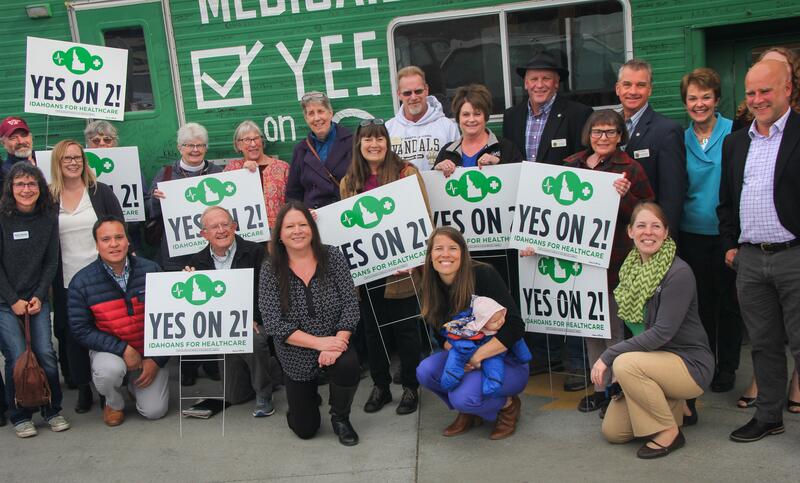 Failed by their elected officials, Idaho residents started an initiative campaign; Prop 2 to expand Medicaid passed easily in November. Regan, chairman of the Kootenai County Republicans and chairman of the IFF, filed suit within days, arguing that the initiative is unconstitutional. One basis for Regan’s claim was the assertion that Prop 2 delegates “future lawmaking power” to the federal government. Regan cited a precedent in which a state law was previously ruled unconstitutional – a law that contained a provision authorizing federal action. Regan argued that the feds might abruptly cut their contribution to the Medicaid expansion from 90 percent to 71 percent, leaving Idaho in fiscal shambles. Regan argued that Prop 2 granted unconstitutionally broad powers to the state Department of Health. Regan claimed the federal government might someday change income requirements for Medicaid, leaving Idaho on the hook for the higher bill. Throughout Burdick’s opinion, “without merit” contends with “unpersuasive” as the most-used judgment on argument after argument. Burdick notes dryly that Regan challenges Medicaid expansion, but somehow not Medicaid itself. “If we were to accept Regan’s argument that any reference to a federal statute delegates lawmaking authority to the federal government, then many of Idaho’s statutes would be unconstitutional, and in fact, the option of any cooperative federal-state program would be curtailed,” he wrote. The ruling was a thoroughgoing, one-sided rout. It repeatedly emphasized the standing and “presumption of validity” that accompanies a legally passed citizens initiative and brusquely dismissed underbaked constitutional arguments. Stubborn ideological and political resistance to the ACA is both familiar and tiresome, and its history has been littered with bad-faith arguments and phony anecdotal fluff predicting the end of the world. Remember Bette from Spokane? Little has changed among the true believers, though there is rising popular support for the ACA as efforts to repeal it failed, and though the citizens in states like Idaho and Utah have made it clear that they disagree with the ideologues in their legislatures. Legislation will determine how expansion will work will work in Idaho, and the likelihood of proposals to hamstring the program through eligibility changes or work requirements seems high. Lawmakers contemplating such changes might not be treading the same legal ground as the constitutional challenge, but they will be drawing from the same well of bad faith, overconfident constitutional misinterpretation and meritless logic. They should not forget the drubbing Brent Regan took at the Idaho Supreme Court.